It may seem unusual, but a dorm bucket is actually an incredibly versatile and functional dorm supply. But who has room to store a bucket in already cramped dorm storage? As usual, DormCo has thought of an ingenious way to give you function without sacrificing space in your college closet or under your bed. 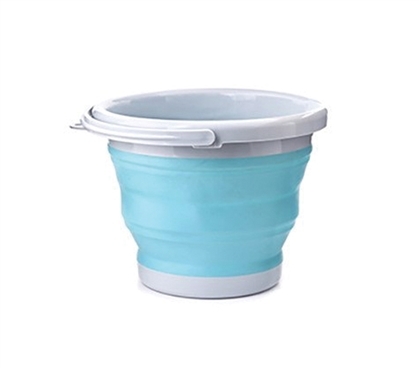 Our collapsible and compact five liter dorm storage bucket in aqua is made of a sturdy silicone for durable function that can also fold up and be tucked into your college closet, dorm desk, or any small open space in your dorm room. Dorm buckets are perfect for cleaning up dorm spills or messes, cleaning your dorm room, hand washing delicates, washing off stains on your shoes, washing dishes (especially if your college dorm doesn’t have any communal kitchens or just don’t feel like going into the common area), as well as for making friends when someone else in the dorm needs a bucket! It may seem a strange dorm essential, but our inexpensive and durable dorm supply is perfect for those unpredictable moments in your college dorm when, well, you could really use a bucket.